Like all decent prosumer compacts, there’s a hotshoe onboard which can take the optional DMW-FL360 or DMW-FL500 flashguns, although they’re disappointingly priced. The DMW-FL360 starts at around a hefty £170 and the DMW-FL500 positively attacks your wallet at around £320. 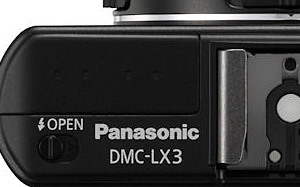 It’s a real shame Panasonic don’t supply a cheaper and more compact external flash gun for the LX3 as both of these will dwarf the camera and make it uncomfortably top heavy. Sort it out, Panasonic! In line with its enthusiast/pro leanings, the LX3 packs in a host of exposure options, giving users complete control via Manual, Aperture or Shutter Priority modes, with the maximum f2.0 aperture usable all the way up to 1/2000. 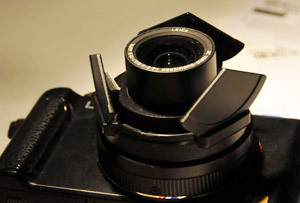 The joystick can be used to quickly make adjustments in Aperture or Shutter Priority modes, with pushes in different directions letting you alter exposure settings on the fly. It’s a little fiddly at first, but we got the hang of it pretty quick. Night photographers are particularly well served by the LX3 with a gloom-illuminating maximum exposure time of 8 seconds in Aperture or Shutter Priority, and a mighty 60 seconds in Manual or the Starry Sky preset. When it comes to scene presets, the Lumix covers just about everything short of Biblical conditions and alien invasions, with a choice of no less than 24 options of varying usefulness (we don’t think we’ll be needing the Food, Party, Candle Light, Baby1 and Baby2 presets any time soon), but the real star of the show is the Lumix’s superb Intelligent Auto (iA) mode. This employs a heady mix of Intelligent Scene Detection, Intelligent ISO and Intelligent Exposure to work out what kind of scene it’s looking at, and then sets the exposure accordingly. The mode icon in the top corner changes to reflect the calculated scene and we found this was unnervingly accurate – at a fireworks show, we pointed it at the night sky and it switched to ‘starry night’ – but as soon as a few rockets went off, it changed to ‘fireworks’ mode. Very neat. The Intelligent Auto mode can also call upon Optical Image Stabiliser, face detection, quick AF and digital red-eye correction too and we found it worked superbly well and is probably the smartest automatic mode we’ve ever tested. 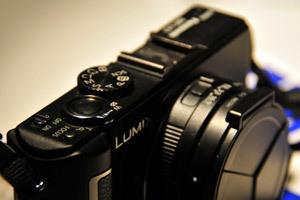 We were extremely pleased with the quality of the photos taken on the LX3. We found the Intelligent Auto mode to be so, well, intelligent, that we grew increasingly confident in its ability to handle tricky lighting situations that we left it switched on for a lot of our shooting. Photographs were bright, crisp, well exposed displaying above average dynamic range with excellent colour reproduction. Any suspicion of a slight softness in some images was easily remedied in Photoshop. Noise was a vast improvement on previous LX models, with images noise-free at ISO 80, 100 and 200, and only starting to creep in at ISO 400. At ISO 800 things got a bit noisier with some loss of fine detail – especially in shadow areas – although still usable for smaller prints. Into the heady heights of ISO 16000 and 3200 things got as noisy as you might expect, with image quality suffering major deterioration. There is also an optional High Sensitivity mode that goes up to Alpine peaks of ISO 6400, but that’s really unusable unless you’re outputting to a postage stamp print. Although some may find the reds and oranges a bit on the bright side, there was virtually no sign of chromatic aberration or purple fringing and the white balance was accurate throughout (and easily adjustable). The 720p HD video recording is a nice touch for a camera so small, and the results were rather impressive, although it’ll never replace a proper camcorder. We’ll come straight out and say it: we loved this camera. 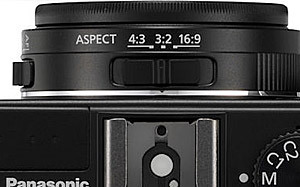 For serious photographers, the feature list is nigh on perfect with lots of manual and creative controls, good ergonomics, a sensible megapixel count, RAW file support and a superfast lens with a useful wide angle range. Although the 24-60mm zoom range may be restricting for some, we found it to be a decent compromise for the quality of the lens on offer, providing a perfectly usable range for street snappers and everyday shooting. The new 10 megapixel sensor was a big improvement on other Panasonic compacts, and the fast f2.0 lens and optical stabiliser should help keep you the noisy fug of the high ISO settings at bay. Overall we found the LX3 to be a well-made, great looking, carry-everywhere camera with a superbly effective auto mode backed up by a comprehensive suite of manual controls. Shutter Speed P:1-1/2000sec (Selectable minimum shutter speed) A/S:8-1/2000sec, M:60-1/2000sec Starry Sky Mode : 15, 30, 60sec. Thanks for an excellent review. Just one thing. The mode dial does include two Custom Modes, but C2 has 3 modes (C2-1 C2-2, C2-3)), so you actually have 4 custom modes available. Thanks again for a fine review. 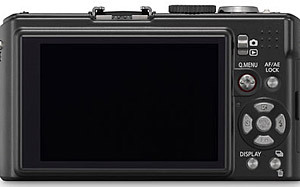 I recently got one of these (in black), and I concur – it’s a superb little camera. The iA mode is outstanding, too. I replaced the previous “low light king,” the Fujifilm F31, with the LX3, and I’m not looking back. The “all auto” mode on the F31 jacked the ISO up to 800 way too easily, even with flash. The LX3’s “all auto” mode, Intelligent Auto, is actually very usable, and I leave the camera set to that mode when I put it away, so it’s ready for a fast shot if I need one. With flash shots, it usually sets ISO to 100 – very usable. Mostly, I use it in Program mode at ISO 80, Nostalgic film mode, RAW+jpg, and I get wonderful results. This is a great piece of, er, “kit,” as you lot across the pond say :-) (I’m in the US).